This past Sunday, I went on my first run for ages – and managed all of 5k. I have run a few half-marathons in fitter periods, after each of which I vowed that I would never – never, ever – run a full marathon. So I’m always full of awe and admiration for those that do. I’m out of town this Sunday so not able to cheer on my intrepid friends (and perfect strangers) in person – which I love to do, volubly – so let me cheer them on digitally instead. There are some fantastic theatre industry folks – including my great friend, producer Ros Povey (go go go, Ros!) running the London Marathon this Sunday, for a variety of good causes. Here’s a little more about who they are and why they’re doing it. What do you do in Theatreland? I’m running for the Almeida Theatre. Almeida Theatre Participation creates opportunities for children from all different backgrounds to engage in theatre. Why did you decide to run? Why this charity? I was shocked when I found out that, as well as Islington being home to some of the richest, it’s also labeled as having the fourth highest level of child poverty in England. 11.4% of families have incomes of over £75,000 whilst a further 28.7% of families in Islington have incomes of less than £20,000, whilst 15,000 children live in families where nobody works. In total, Almeida works with over 3,000 young people a year to increase confidence, communication and team-work. In March I was lucky enough to see their work in action, bringing together four local schools, devising four 20-minute performances inspired by their current production. To see the children stand up on the Almeida stage when they might have never got the opportunity to witness a theatre performance in their life was truly inspirational. I feel very passionate that our industry should be as diverse as possible and the Almeida is actively creating talented artists ready to launch onto the world stage. Their alumni include recent Olivier Award winner Robert Ike and Star Wars actress Daisy Ridley. I’ve been in training since 30 December with my best friend who sadly had to pull out in February due to injury. That’s the best part of four months spending sometimes five hours running on your weekends. I’ve also not had any alcohol for three months now, which was also a massive challenge for me! The biggest surprise as a first-timer was the huge commitment it’s been on not just me but my close friends and family – they’ve been filming the process and I now understand what fellow runners mean when they say this couldn’t be done without them. Click here to sponsor Sophie! Which charity are you running for? I’m running for British Heart Foundation, who provide vital information and care for people suffering from heart disease and also fund life-saving research and initiatives such as campaigning for defibrillators in every public place and teaching people how to save someone’s life if they’re having a heart attack. I got a marathon place in the ballot last October, which I applied for as I’d (secretly) always wanted to have a go at the distance. I knew I’d run it for charity and boiled the choice down to two. My partner survived a heart attack at the age of 41, which made me more aware, but it wasn’t until a close colleague Karen Marshall died suddenly of a heart attack last August that I saw how devastating the effects of undiagnosed heart disease can be for a person’s family and friends. She was only 57 and known to a lot of people in theatre, working for Roger Wingate at Curzon/Act for 38 years. I miss her good humour and sound advice a lot. BHF rely entirely on donations to fund their work, and British Heart Runners will raise £800K in this year’s marathon to help that happen. I’m really proud to be one of them. How has your training gone? As a theatre night owl with irregular hours, early mornings are impossible for me, I prefer to run in the dark. I’ve only raced shorter distances so building up the mileage was hard and I’ve had every sort of runner’s issue from IT band and Achilles to dehydration and blisters! Hopefully, it will be alright on the night. Click here to sponsor Ros! Manna. They build and run soup kitchens, helping to eliminate poverty amongst children and families. The money I raise is going to a multi-cultural food centre in Haifa, helping to bring any race, religion, creed or colour together; at the end of the day we are all human! In this sometimes horrible and war-torn world, it’s great to see charities like this striving to help others. The reason for running is like an onion. Many layers. The main reason being that ‘Manna’ are brilliant. I truly believe in what they do and they never, ever stop striving to build better lives for people. I would do anything for this charity. I was getting a bit chubby and I wanted to run a marathon before I was 30. To prove to my ex-fiancée I’m not completely worthless! Great but intense. I only found out at the end of January I got a place and during that time (whilst playing football) I ripped my ankle ligament so I’ve had to play catch-up. I think I’ve done a good job. Click here to sponsor Mike! I’m an actor, currently playing Maureen in Mrs Henderson Presents at the Noel Coward Theatre. Save The Children UK – a brilliant charity which raises funds to help children in vulnerable circumstances worldwide. I first got involved with Save The Children UK in May 2015 when I shot the Christmas Jumper Day ad campaign for them as a volunteer (mainly because I adore anything Christmas related!) but also because I think the work they do worldwide is brilliant and utterly vital, particularly in giving children the opportunity to remain children when growing up in turbulent societies. I’ve always wanted to run the London Marathon properly (I did it very badly in 2012) and it seemed a great way to raise money for a fantastic charity. Training has been tough, what with rehearsing and opening Mrs Henderson Presents and the Olivier Awards, but also as I’ve been ill in the past few weeks which has scuppered some of my later training. However, I ran the Silverstone half-marathon in a Personal Best of 1hr 59 and my 20-miler came in at 3hrs 11 so I’m hoping for a good time on Sunday. I’ll be happy to just finish and get in an ice bath though! Click here to sponsor Emma! Producer, currently producing In the Heights at the King’s Cross Theatre and End of the Rainbow on tour. 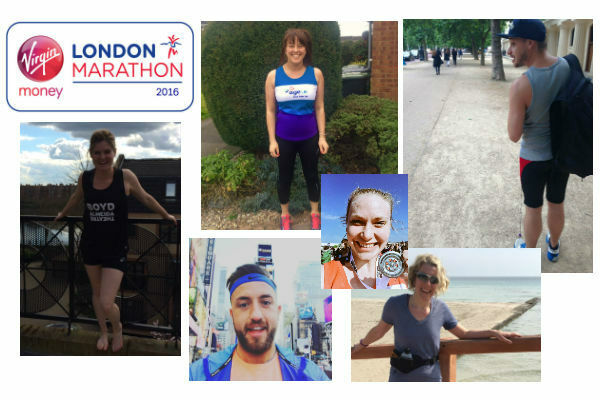 I’m running the London Marathon for the Orchid Cancer Appeal. Orchid exists to save men’s lives from testicular, prostate and penile cancers through research and promoting awareness. My father passed away seven years ago to cancer and I thought this would be a positive tribute to his passing. Without realising until now, the marathon has been as much about giving me a sense of perspective as it has been truly helpful in raising thousands of pounds for Orchid. The training alone has been the hardest challenge I have ever faced and I’m looking forward to having my life back (and toenails). I don’t think anything can actually prepare you for how long 26.2 miles is and what happens to you emotionally and physically throughout the whole process. I have the utmost respect for anyone bonkers enough to do it. Click here to sponsor Paul! This is my first marathon and I’m running for Age UK as I’ve seen first-hand the positive changes that the charity makes through volunteering works. As the Children’s MD for Matilda, I ran a singing group whilst volunteering at my local Age UK, where I played songs for the older clients, teaching breathing exercises and ways to improve their posture. I also volunteered as a befriender to a lady called Iris, who at 99 had outlived all of her family and was very lonely. Iris was a music teacher, so I would go round to hers, serve some tea and cake, and play her songs on her piano which Iris would sing along to. Through the visits, I helped ease Iris’ loneliness until she sadly passed away last year. I hope to raise enough money through my fundraising to help fund further befriending services to help tackle loneliness and isolation in later life. I’m a Type 1 diabetic so running the marathon (which will be my first) will be a tremendous physical and mental achievement for me. I started running as a way to deal with some difficult stuff I was going through – in January 2015 I couldn’t even run ten minutes without having to stop. I ran a half marathon as part of my training in November, and managed to finish it in 2h 19 mins. I’ve been working really hard and have undergone a massive physical and mental transformation because of running – it’s really changed my life. So I’d love to use it to give back and possibly to help to change someone else’s life through the money I raise. Click here to sponsor Laura!